FIGURE 4. Mouse brain was cross-linked and disaggregated into a single-cell suspension using a Dounce homogenizer. The chromatin was prepared and digested, and chromatin immunoprecipitations were performed using the indicated ChIP-validated antibodies. Purified DNA was analyzed by quantitative real-time PCR using SimpleChIP® Mouse GAPDH Intron 2 Primers #8986, SimpleChIP® Mouse RPL30 Intron 2 Primers #7015, SimpleChIP® Mouse HoxA1 Promoter Primers #7341, and SimpleChIP® Mouse HoxD10 Exon 1 Primers #7429. The amount of immunoprecipitated DNA in each sample is represented as signal relative to the total amount of input chromatin (equivalent to 1). FIGURE 5. Mouse liver was cross-linked and disaggregated into a single-cell suspension using a tissue disaggregator. The chromatin was prepared and digested, and chromatin immunoprecipitations were performed using the indicated ChIP-validated antibodies. Purified DNA was analyzed by quantitative real-time PCR using SimpleChIP® Mouse GAPDH Intron 2 Primers #8986, SimpleChIP® Mouse AFM Intron 2 Primers #7269, SimpleChIP® Mouse HoxA1 Promoter Primers #7341, and SimpleChIP® Mouse HoxD10 Exon 1 Primers #7429. The amount of immunoprecipitated DNA in each sample is represented as signal relative to the total amount of input chromatin (equivalent to 1). FIGURE 1. Chromatin immunoprecipitations were performed with cross-linked chromatin from HCT 116 cells and either TCF4/TCF7L2 (C48H11) Rabbit mAb #2569, Non-phospho (Active) β-Catenin (Ser33/37/Thr41) (D13A1) Rabbit mAb #8814, or Tri-Methyl-Histone H3 (Lys4) (C42D8) Rabbit mAb #9751, using SimpleChIP® Plus Enzymatic Chromatin IP Kit (Magnetic Beads) #9005. DNA Libraries were prepared using SimpleChIP® ChIP-seq DNA Library Prep Kit for Illumina® #56795. The figure shows binding across ACSL5, a known target gene of TCF4/TCF7L2, β-Catenin, and H3K4me3. For additional ChIP-seq tracks, please download the product data sheet. FIGURE 2. Chromatin immunoprecipitations were performed with cross-linked chromatin from mouse liver and either Tri-Methyl-Histone H3 (Lys4) (C42D8) Rabbit mAb #9751 or FoxA1/HNF3α (D7P9B) Rabbit mAb #58613, using SimpleChIP® Plus Enzymatic Chromatin IP Kit (Magnetic Beads) #9005. DNA Libraries were prepared using SimpleChIP® ChIP-seq DNA Library Prep Kit for Illumina® #56795. 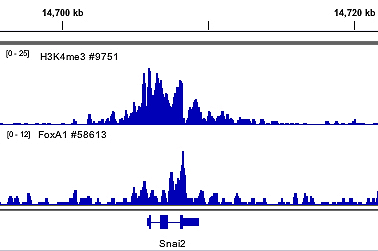 The figure shows binding across Snai2, a known target gene of H3K4me3 and FoxA1. For additional ChIP-seq tracks, please download the product data sheet. FIGURE 3. 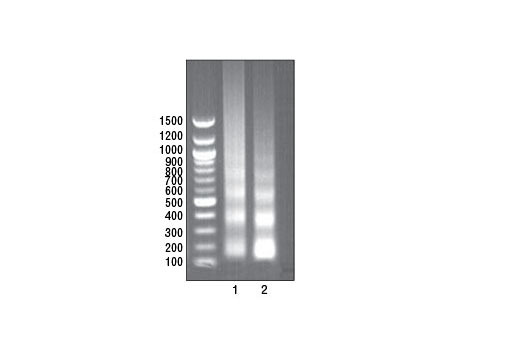 Chromatin immunoprecipitations were performed with cross-linked chromatin from mouse liver and either RING1B (D22F2) XP® Rabbit mAb #5694 or SUZ12 (D39F6) XP® Rabbit mAb #3737, using SimpleChIP® Plus Enzymatic Chromatin IP Kit (Magnetic Beads) #9005. DNA Libraries were prepared using SimpleChIP® ChIP-seq DNA Library Prep Kit for Illumina® #56795. The figure shows binding across HOXD, known target gene of RING1B and SUZ12. For additional ChIP-seq tracks, please download the product data sheet. FIGURE 6. Mouse brain or mouse liver were cross-linked and disaggregated into a single-cell suspension using a Dounce homogenizer or tissue disaggregator, respectively. The chromatin was prepared and digested, and chromatin immunoprecipitations were performed using the indicated ChIP-validated antibodies. DNA was purified and 10 μl was separated by electrophoresis on a 1% agarose gel and stained with ethidium bromide. The majority of chromatin from both brain (lane 1) and liver (lane 2) was digested to 1 to 5 nucleosomes in length (150 to 900 bp). The SimpleChIP® Plus Enzymatic Chromatin IP Kit (Magnetic Beads) #9005 contains the buffers and reagents necessary to perform up to 30 chromatin immunoprecipitations from cells or tissue samples, and is optimized for 4 X 106 cells or 25 mg of tissue per immunoprecipitation. A complete assay can be performed in as little as two days and can easily be scaled up or down for use with more or less cells or tissue sample. This kit is compatable with ChIP-seq. Cells or tissue are fixed with formaldehyde and lysed, and chromatin is fragmented by partial digestion with Micrococcal Nuclease to obtain chromatin fragments of 1 to 5 nucleosomes. Enzymatic fragmentation of chromatin is much milder than sonication and eliminates problems resulting from variability in sonication power and emulsification of chromatin during sonication, which can result in incomplete fragmentation of chromatin or loss of antibody epitopes due to protein denaturation and degradation. Chromatin immunoprecipitations are performed using ChIP-validated antibodies and ChIP-Grade Protein G Magnetic Beads. After reversal of protein-DNA cross-links, the DNA is purified using DNA purification spin columns, allowing for easy and efficient recovery of DNA and removal of protein contaminants without the need for phenol/chloroform extractions and ethanol precipitations. The enrichment of particular DNA sequences during immunoprecipitation can be analyzed by a variety of methods, including standard PCR, quantitative real-time PCR, or amplification for ChIP on chip, sequencing or cloning techniques. This kit is compatible with ChIP-seq. 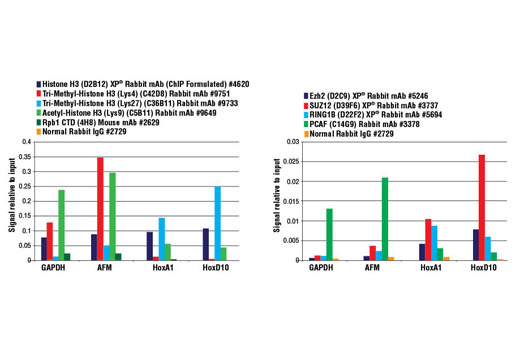 The SimpleChIP® Plus Enzymatic Chromatin IP Kit can be utilized with any ChIP-validated antibody to detect endogenous levels of protein-DNA interactions and histone modifications in mammalian cells and tissue samples (see Figures 1-6). The positive control Histone H3 Antibody recognizes many different species of the highly conserved Histone H3 protein, including human, mouse, rat and monkey. 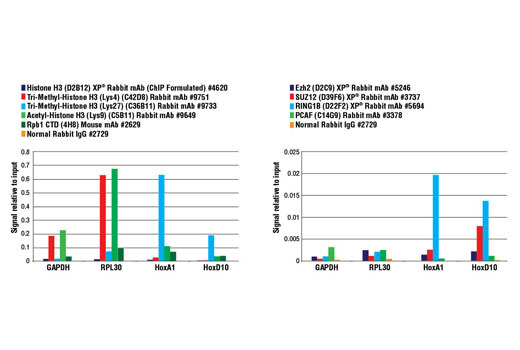 Primer sets are included for the human and mouse positive control RPL30 gene loci; however, the use of other species with the kit requires the design of additional control primer sets. Chen, W.X. et al. (2016) Oncotarget , . Wang, J. et al. (2016) Sci Signal 9, ra12. Hayashi, H. et al. (2015) Cancer Res 75, 4985-97. Mukherjee, S.P. et al. (2013) PLoS Biol 11, e1001647. Li, D. et al. (2016) Oncotarget , . Wang, Y.F. et al. (2017) Nat Commun 8, 274. Fujita, K. et al. (2017) Nat Commun 8, 1864. Hasan, Z. et al. (2017) Nat Commun 8, 15628.
van Loo, K.M. et al. (2015) Nat Commun 6, 8688. Zeng, H. et al. (2016) Cancer Cell 30, 459-473. Aida-Yasuoka, K. et al. (2014) Toxicol Sci , . Masuda, T. et al. (2014) Nat Commun 5, 3771.